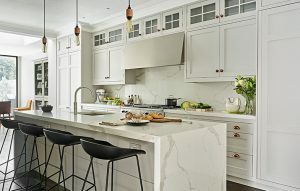 Shaker kitchen cabinets, Statuario grey composite marble worksurfaces, copper accents and modern appliances combine to create a kitchen that offers a classic style with a contemporary edge for this Victorian house in Putney, South West London. 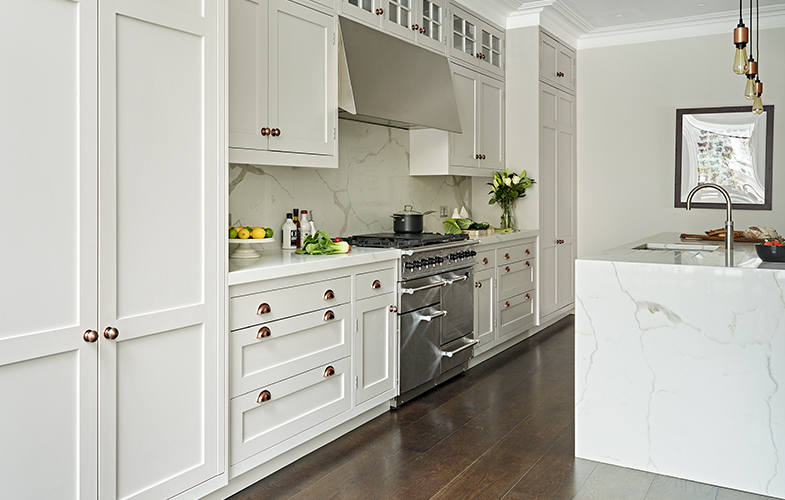 Floor to ceiling bespoke kitchen cabinets not only provide more storage but accentuate the generous height of the room in this traditional Victorian house in Putney. 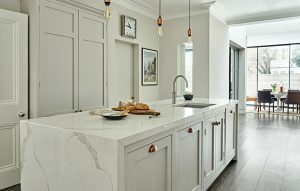 Hand-painted in ‘French Grey’ by Little Greene, these shaker style cabinets feature contrasting copper handles to match the over-island copper bulb pendant lighting. 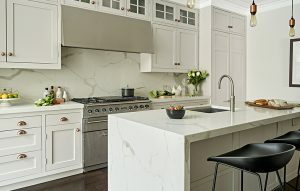 The Statuario grey composite marble worktop, splashback and island add a lavish touch alongside the traditional, understated style of the kitchen cabinets. 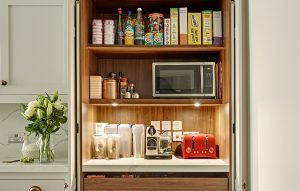 A pantry cabinet/breakfast cupboard houses small appliances neatly whilst also providing power, lighting and extra worktop space inside. 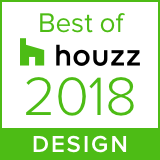 The cabinets also house a range of integrated Siemens appliances whilst a stainless steel Falcon range cooker is a central feature of this kitchen design.